Georges Street, Newbridge is at the heart of the busy country town and is located midway along the Main Street running North West between it and Eyre Street. 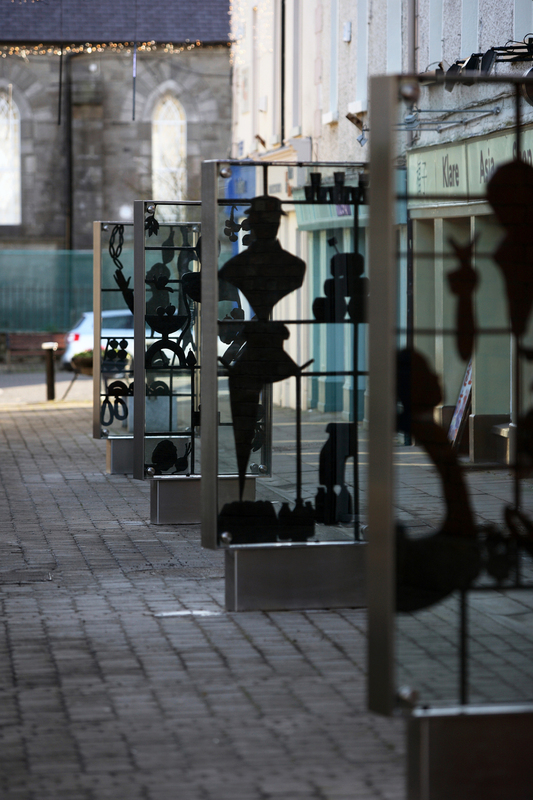 A number of years ago well know artist, Ann Meldon Hugh was commissioned to create a number of sculptures depicting the tradition of trade in the town. Omos liaised with the council and the artist to arrive at a solution which was both sympathetic to the works of art while meeting the practical needs of the council. Georges Street, Newbridge is at the heart of the busy country town and is located midway along the Main Street running North West between it and Eyre Street. 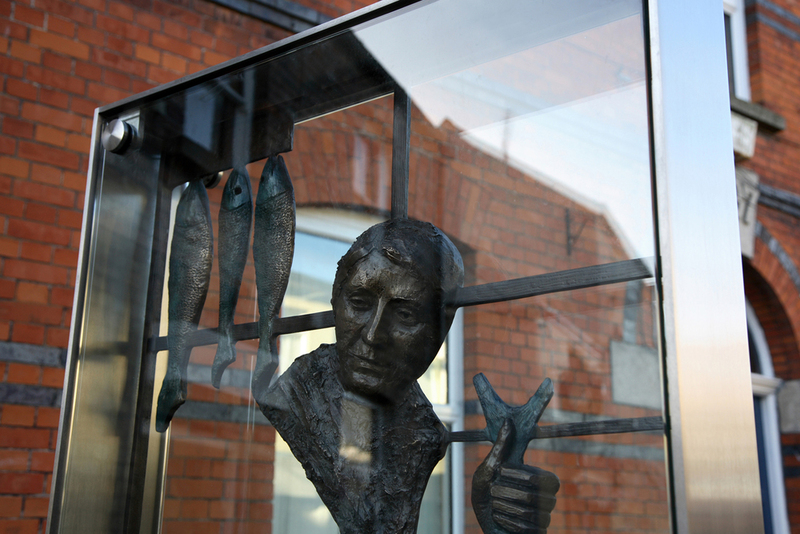 Some years ago well know artist, Ann Meldon Hugh was commissioned to create a number of sculptures depicting the tradition of trade in the town. The original plan was to mount this pieces on the building facades but it was later decided that they would gain more prominence if they were displayed in cases along the street. Omos liaised with the council and the artist to arrive at a solution which was both sympathetic to the works of art while meeting the practical needs of the council. The cases are constructed from plate stainless steel and toughened glass to produce a minimalist aesthetic, parallel in material quality to the works themselves. The simplicity of their design offers no competition nor distraction to the works of art while keeping them safe from the elements and any unwanted attention from the public. 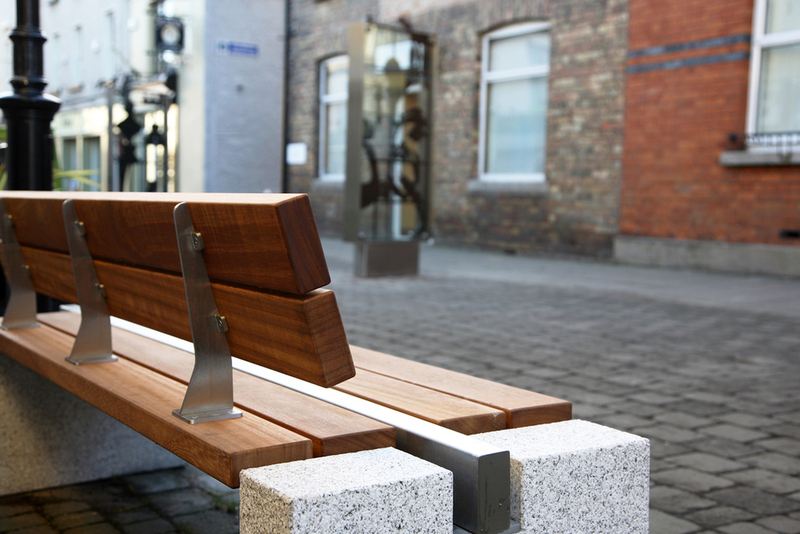 Our s83 seat and bench with bush hammered stone ends along with the s16.2 litterbin was the chosen street furniture for the scheme.